David Boyce, PhD, has dedicated his career to confronting urban transportation challenges through his research. And now he is dedicating funds through an annual gift to support UIC doctoral students who also conduct research in the transportation engineering and planning field. 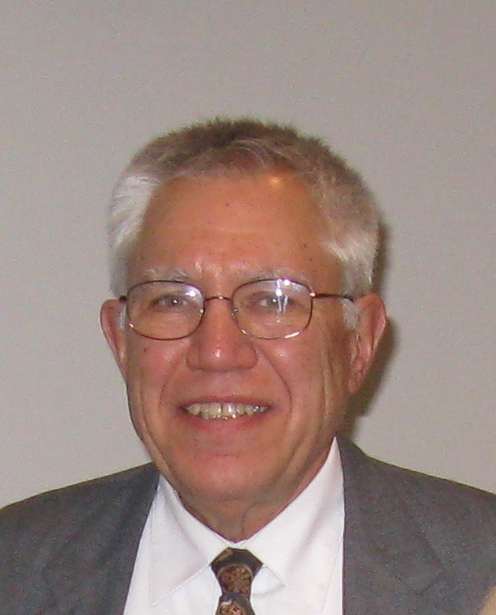 Boyce is emeritus professor of transportation and regional science in UIC�s Department of Civil & Materials Engineering. As a result of his gift to UIC, eight graduate students in transportation planning have received support over the last two years. Recipient Ramin Shabanpour Anbarani, who studies the role of autonomous vehicles in transportation planning models, says �being recognized with this award boosts my confidence and trust in my ability to achieve my goals�and my ultimate goal is to run my own consultancy.� Read more. Please note course change: CME 497, Capstone Design, does not count toward the graduate level degree course requirements. This class was originally CME 397, Senior Design II. The change has appeared in the University catalog. 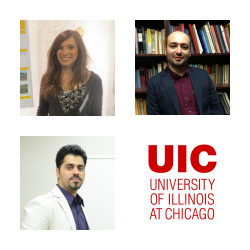 Two faculty members in the Department of Civil and Materials Engineering (CME) have received �2016 COE Seed Funding Awards.� Only 14 proposals were chosen from among 36 submitted proposals after a review by UIC�s College of Engineering (COE) Executive Board members and the COE Administrative Council members. The review criteria is based on leveraging, significance, approach, and feasibility. Funds are for the support of exploratory research to be accomplished by the investigator(s) in one year. 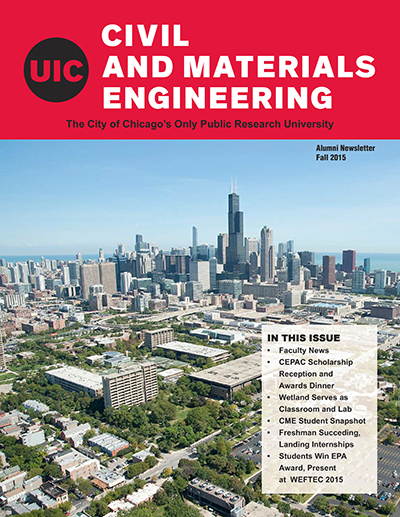 The Department of Civil and Materials Engineering at UIC has moved up in the latest U.S. News and World Report rankings of graduate Civil Engineering programs. CME moved up substantially in the rankings to 62nd overall, which is the 39th percentile. The new ranking shows CME racing nine spots higher than its 2014 ranking. 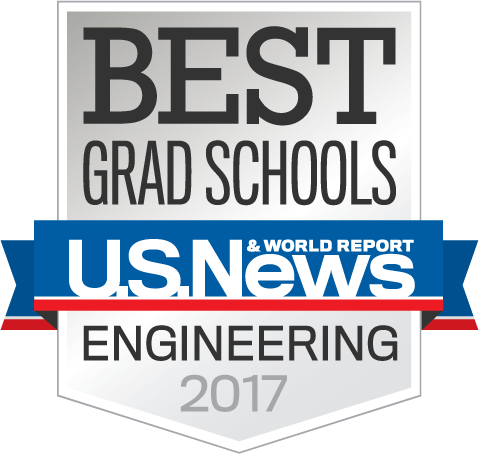 The latest ranking has UIC tied with Civil Engineering programs at Auburn, Michigan Tech, Louisiana State, University of Nebraska, Oklahoma and the University of Tennessee. Each school's score reflects its average rating on a scale from 1 (marginal) to 5 (outstanding), based on a survey of academics at peer institutions. Distinguished Professor Farhad Ansari has been awarded a grant for $312,995 from the Federal Highway Administration for the project entitled "Implementation of Existing BWIM Technology." Ansari is the sole PI for the grant that is slated to last 18 months. This project pertains to the implementation of the existing Bridge Weigh-in-Motion (BWIM) technology developed at the University of Illinois at Chicago. The BWIM technology is based on monitoring the shear response of the bridge girders near the abutments of the bridge. The system was developed based on the use of fiber optic rosettes sensors. Previous research on the shear based fiber optic sensor based system revealed encouraging results on limited number of bridges. In contrast to the existing flexural-based BWIM systems that are limited to short spans (maximum 45 feet) and narrow bridges, the shear based BWIM system has demonstrated potential for applications to a wider range of bridge spans and types. The primary objective of this project is to instrument two bridges with the shear based fiber optic BWIM system. The plan includes instrumentation of bridges in Oregon and Wisconsin. 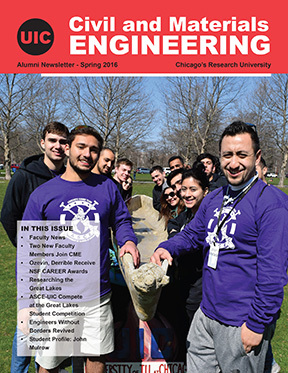 Good news from Interim Department Head Karl Rockne, faculty highlights, 2016 NSF CAREER Award winners, Researching the Great Lakes, ASCE at compete at the Great Lakes Student Conference, the return of Engineers Without Borders, and the Student Sanapshot. UIC placed in the top half of the highly competitive Great Lakes Student Conference on April 14-16 at IIT in Chicago. 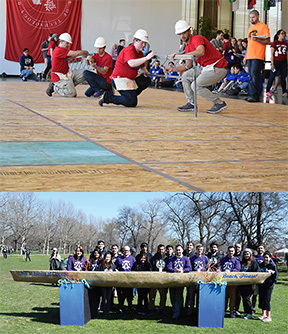 The American Society of Civil Engineers (ASCE) members competed against 18 universities during the annual conference, which is made up of schools from southern Wisconsin, northern and central Illinois, and Indiana, and it is one of the largest regions based on number of schools. The schools competed in a set of Civil Engineering-based competitions. At a regional level, eight competitions are typically hosted. John Mulrow is going to change the world for the better! He is about to complete his Master�s Degree in Civil and Materials Engineering with a focus on Environmental Engineering. With two additional years of an NSF Graduate Research Fellowship, you would think the 29-year-old would be eager to start working on his Ph.D. Instead, the new CME alumnus is getting ready to report for basic training with the U.S. Army. I�ve always been able to do math and science work, so a profession in engineering seemed to make sense. I would have to say that it may have begun playing in the sand as a child building sand castles. You learn that your structure will be stable until it dries, walls can only be built so high. Later this makes sense based on your understanding of surface tension and capillary pressure, but as a kid you just observe. I became interested in engineering in College. I had a fantastic Civil Engineering professor (David Billington) who taught how works of engineering can transcend simple infrastructure and become art. Not art only in the sense that works of civil engineering are visually impressive, but art in the sense that they are a thoughtful convergence of form and function. Professor Krishna Reddy received a $77,150 supplement grant to his National Science Foundation (NSF) project entitled "Modeling Coupled Dynamic Processes in Landfills: Holistic Long-Tern Performance Management to Improve Sustainability." In September, Reddy was been awarded a three-year $280,000 grant from the National Science Foundation to develop a model to transform dry-tomb landfills into efficient waste treatment systems. The award amount with this amendment totals $356,431 and ends August 31, 2018. Read more at Reddy Grant. CME Assistant Professor Sheng-Wei Chi has been awarded a new $149,302 grant entitled "Meshfree Modeling of Munitions Penetration in Soils" from the Department of Defense�s Strategic Environmental Research and Development Program (SERDP). Associate Professor Craig Foster is co-PI on the grant, which runs from Feb. 26, 2016 to Feb. 26, 2017. Learn more at Chi Grant. 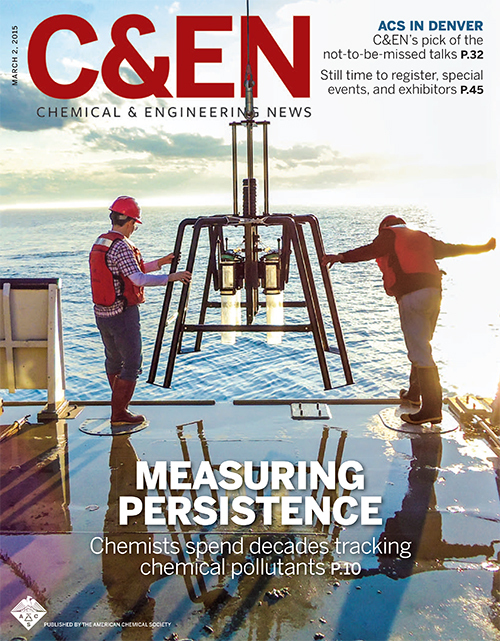 An Li and Karl Rockne have been working together for more than five years to monitor and measure environmental pollutants in Great Lakes sediment. 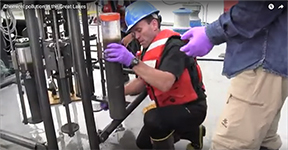 Through the Great Lakes Sediment Surveillance Program, Li, professor of environmental and occupational health sciences in the UIC School of Public Health, and Rockne, professor and interim head of civil and materials engineering in the UIC College of Engineering, have collected more than 1,000 sediment samples in the lakes. Learn more at Examining Pollution. CME�s Professor of Practice Christopher Burke, PhD, PE, D.WRE. Dist.M.ASCE has been inducted into the National Academy of Construction. Chris is a leading expert in stormwater management, and an excellent instructor and innovative educator for his teaching hydraulics, hydrology and our senior capstone design class. This is the one of many awards Burke has received in recent years. Additional awards include the American Society of Civil Engineers (ASCE) Edmund Friedman Professional Recognition Award � where he is one of only five Distinguished Fellows in the Chicago area � the President�s Lifetime Achievement Award from the Purdue Engineering Alumni Association, the Charles Ellet Award from the Western Society of Engineers, the Corporate Philanthropic Award from the West Suburban Philanthropic Network, and an American Public Works Association (APWA) Top Ten Leader of the Year Award. Burke is the founder and President of Christopher B. Burke Engineering, Ltd. Based in Rosemont, Ill He also is an active member of CME�s Civil Engineering Professional Advisory Council (CEPAC), which was established in 2000 to enhance undergraduate education at UIC and consists of civil engineering faculty members and professional practitioners. Learn more about Professor Burke at Burke Profile. 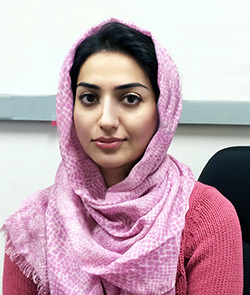 Assistant Professor Didem Ozevin received the $500,000 National Science Foundation Faculty Early Career Development (CAREER) Award for her project entitled �CAREER: Engineered Spatially Periodic Structure Design Integrated with Damage Detection Philosophy.� This project is from June 1, 2016 through May 31, 2021. Read more. 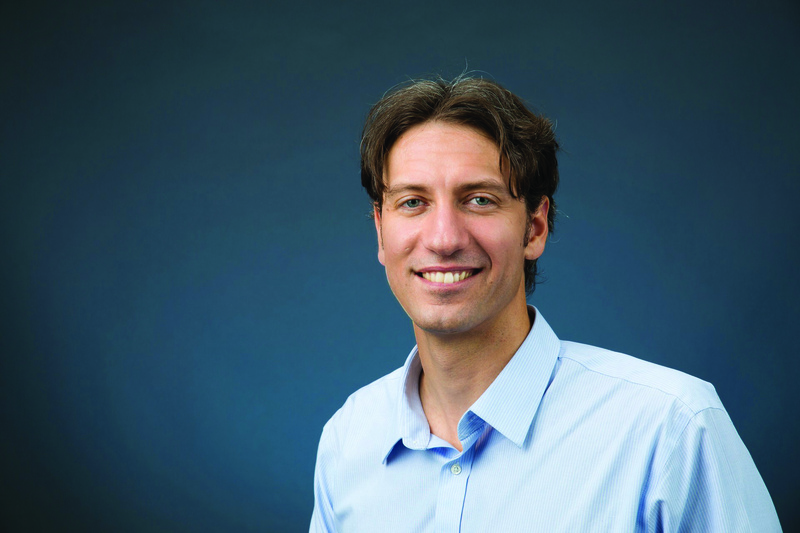 Assistant Professor Sybil Derrible received the $500,000 National Science Foundation (NSF) Faculty Early Career Development (CAREER) Award for his project entitled �CAREER: Understanding the Fundamental Principles Driving Household Energy and Resource Consumption for Smart, Sustainable, and Resilient Communities.� This project is from August 15, 2016 through July 31, 2021. Read more. 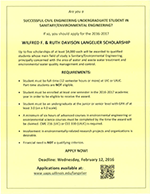 The Wilfred F. & Ruth Davison Langelier Scholarships in Sanitary/Environmental Engineering will be made available to undergraduate students majoring in Civil Engineering and/or whose main field of study is Sanitary/Environmental Engineering, principally concerned with the area of water and waste water treatment and environmental water quality management and control. In addition to performing as a nutrient management practice, the constructed wetland at Thacker Farms in Bureau County also is being used as a laboratory and classroom. Congratulations to the 2015 winners of the Christopher B. and Susan S. Burke poster competition! Erin Yargicoglu (top left) took first place with, "Evaluation of biochar-amended landfill covers for methane mitigation: Biotic and Physical Factors Affecting Long-Term Performance." 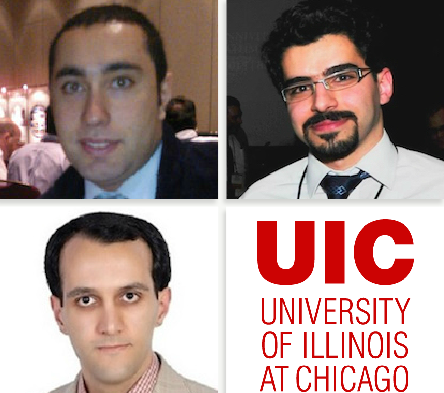 Saeed Karim Baba Najad Mamaghani (top right) won second place with, "Reference Free Dynamic Distributed Monitoring of Damage in Bridges" and Ahmadreza Talebian won third place with "Integrated Modeling of High Performance Passenger and Freight Train Operation Planning on Shared Use Corridors." CME is proud to recognize our department's four winners of the David Boyce Graduate Awards: Mehran Fasihozaman, Ramin Shabanpour, Mohamadhossein Noruzoliaee and Mahmoud Javanmardi (not pictured). The annual David Boyce Awards competition was established to honor the accomplishments of CME Professor Emeritus of Transportation and Regional Science, Dr. David Boyce—a legend in transportation planning and engineering research. The competition is open to all Ph.D. or Master�s students who are studying transportation at UIC, and the award represents a distinct honor for the recipients who have demonstrated significant achievements in their studies and great potential in transportation research. Congratulations, once again, to these talented graduate students! 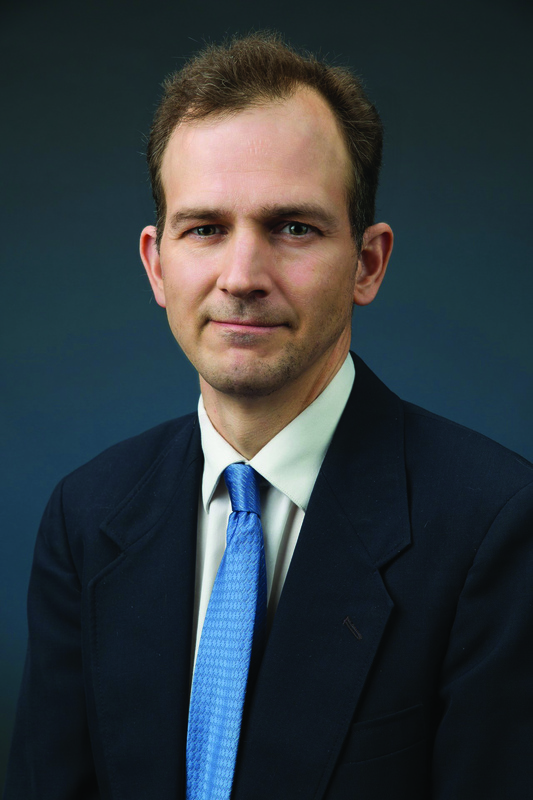 Congratulations to CME Professor Craig Foster for being named a 2015-16 US Fulbright Scholar! Professor Foster's work is to study Earthen Buildings in India. Earthen buildings are an old technology experiencing renewed interest, both in developing and developed countries, for economic and environmental reasons. Dr. Foster's winning proposal focuses on creating material models that can be used to examine mechanical behavior, predict safe use, and improve performance. This research will examine the interaction of the constituent particles and the addition of natural fibers for ductility, and then the mathematical models will be validated and improved by experiments at the host institution, building a collaboration between experimentalists and modelers. 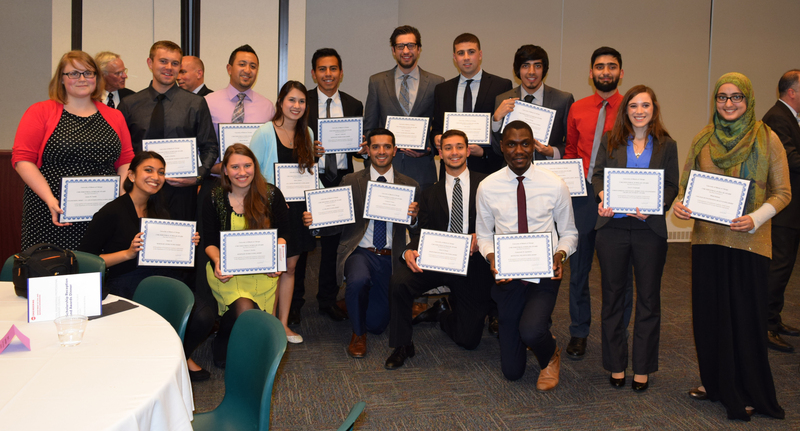 Lives were changed on Tuesday, Nov. 10, 2015, as UIC�s Civil Engineering Professional Advisory Council met with CME�s undergraduate students for the Scholarship Reception and Awards Dinner at UIC. Through the generosity of donors and partners, CME awarded scholarships to 39 students. The support helps UIC in our mission to continue to provide access to excellence and success for our students. Board members added warmth to the introductions as they detailed the scholarship requirements and the interests and accomplishments of the donors. At the event, students received a certificate, and, in many cases, they were able to meet the donor of their scholarship or a corporate representative as they networked during dinner and after the scholarships were awarded. More pictures of scholarship donors and winners are online at CEPAC Scholarship. In this issue: Message from the Interim Department Head—Dr. Karl Rockne, Faculty Highlights, CEPAC Scholarship Reception and Awards Dinner, Wetlands Serves as classroom and Lab, Freshman Snapshot, Freshman Succeeding, Landing Scholarships, Students Win EPA Award and Present at WEFTEC 2015. Read more. 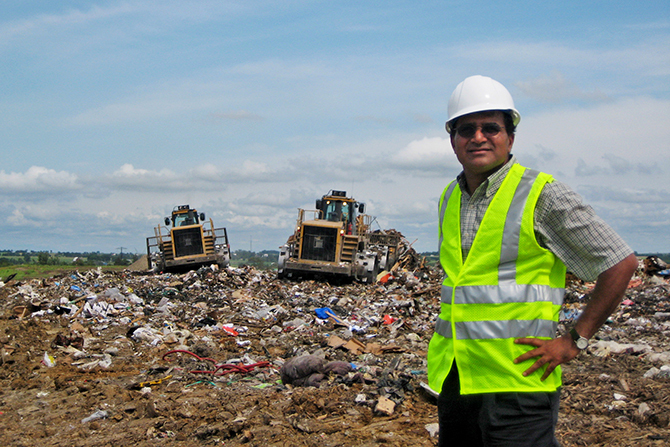 UIC Professor Krishna Reddy, in the Department of Civil and Materials Engineering, is designing landfills that clean themselves. Read more. 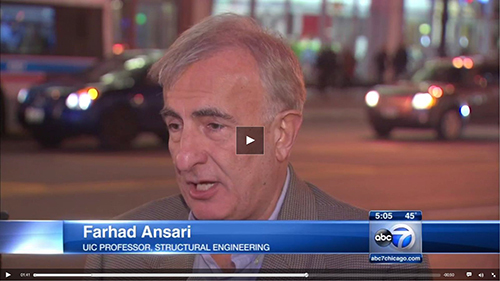 UIC Distinguished Professor Farhad Ansari was interviewed by ABC 7 News about the wind effects on high rise buildings during a recent High Wind Warning in Chicago. Watch the story here. Congratulations to Dr. Farhad Ansari, of the Department of Civil and Materials Engineering, on being named a UIC Distinguished Professor. Dr. Ansari was recommended by a review panel of UIC Distinguished Professors, and the prestigious designation was bestowed upon him by the University Board of Trustees for his outstanding contributions to research and leadership. 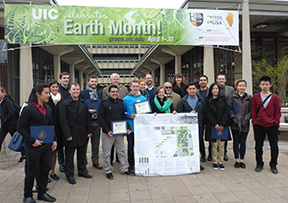 In April, a group of UIC students won the U.S. Environmental Protection Agency�s Campus RainWorks Challenge, which is a national competition the EPA holds for university student groups to design green storm water infrastructure on their campus. Now, the UIC team is bringing the project to McCormick Place in Chicago for one of the largest water quality conferences in the world. Read more. Congratulations to Associate Professor Jane Lin on receiving a new three-year collaborative NSF grant entitled �Smart CROwdsourced Urban Delivery (CROUD) System.� The project will build on collaboration between a CROUD-based technology firm, Zipments, University of Illinois at Chicago, and Northwestern University. The total funding for the project is $1,000,000, with $320,000 coming to UIC over three years. 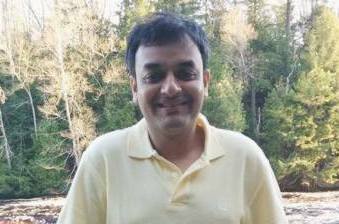 Congratulations to Professor Krishna Reddy for his new three year grant from the National Science Foundation entitled �Modeling Coupled Dynamic Processes in Landfills: Holistic Long-Term Performance Management to Improve Sustainability.� The grant is for $279,281, and this is Professor Reddy�s second active NSF grant in this area. Congratulations to CME's Professor Krishna Reddy, Ph.D., named 2014 Distinguised Researcher of the Year! This award, presented by the UIC Office of the Vice Chancellor for Research, recognizes Dr. Reddy's excellence in using research as a tool to improve society and promote environmental stewardship. His research focuses on solving a number of emerging environmental challenges in waste management using innovative approaches, like phytoremediation—a green technology that utilizes plants to mitigate environmental problems without having to excavate contaminant material and dispose of it elsewhere. In contrast to traditional remediation, Dr. Reddy's research takes a holistic approach that strives to maximize the environmental, social, and economic benefits of a project. He developed a new Social Sustainability Evaluation Matrix to assess socio-economic considerations in selecting remedial technologies based on site-specific conditions. This uniquely addresses the challenging issue of social acceptance and equity in remedial decisions. In addition to National Science Foundation support, Dr. Reddy has collaborated with the Chicago Park District and Argonne National Laboratory on multiple projects, including a field-scale demonstration of phytoremediation at a heavily impacted wetland site in southwest Chicago. This provides value to both the research community and neighborhood, as the restored wetland will eventually serve as a nature reserve and recreational area for local residents. Congratulations to CME's Ph.D. candiate Sk Nasir Ahmad on winning the 2014-15 Institute for Environmental Science and Policy Pre-Doctoral Fellowship. Ahmad's main goal is to better understand how energy and environmental resources are being consumed in the world, using concepts from the novel science of complexity. Ahmad, advised by Professor Sybil Derrible, began work on his research project “Water Consumption Networks in the United States” in 2013 and is now formalizing and applying the network methodology to multiple datasets in the world—including the World Bank’s 1,300 indicators. The paper for this project, "Evolution of Water Consumption in the USA: A Network Approach," is pending publication. In addition to his IESP fellowship, Ahmad also won a fellowship in February 2014 to attend a week long workshop on "Introduction to Complexity & Complexity Science" at Nanyang Technological University in Singapore. Congratulations to Soheil Hosseini on winning the 2014-15 Institute for Environmental Policy Pre-Doctoral Fellowship. Hosseini, a third year Environmental Engineering Ph.D. student advised by Interim Department Head, Professor Karl Rockne, initially worked on the Great Lakes Sediment Surveillance Program (GLSSP) funded by the U.S. Environmental Protection Agency (USEPA), doing in-depth field research, while mentoring and training undergraduate interns in the lab to perform multi-stage analysis on tight deadlines. With his award-winning research project, "Controls on the Accumulation and Transformation of Semi-Volatile Halogenated Persistent Bioaccumulative Toxic Compounds in the Great Lakes," Hosseini seeks to better understand processes affecting both the sources and fate of persistent bioaccumulative toxic compounds (PBTs) in the Great Lakes sediment, so that he can contribute to the improvement of pollution control and resource management for the Great Lakes. ABC7 Interviews CME Department Head Farhad Ansari about glass cracks in the Willis Tower Skydeck Ledge. Watch video. 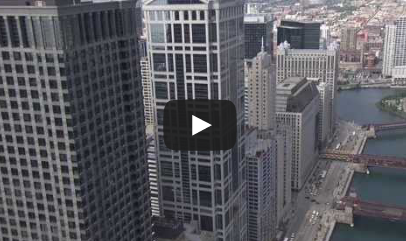 UIC ASCE Students Win Big at Great Lakes Regional Conference; Head to Nationals. Read more. Are potholes inevitable, or can we prevent winter misery? Professor Mohsen Issa offers the best solution to our pothole problem in this Daily Herald article. CME researchers develop new ways to monitor bridge safety. Watch video. CME student Zahra Heidary receives the Chancellor�s Graduate Fellowship Award. 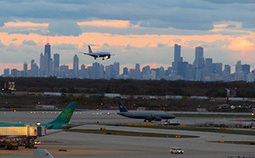 CME assistant professor, Bo Zou, appears on WTTW's Chicago Tonight to talk about the pros and cons of the new runways opening at O'Hare airport. 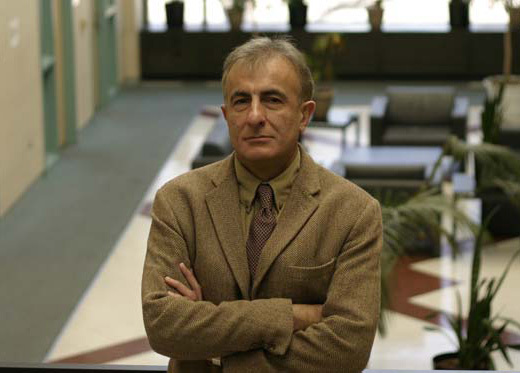 There will be a special symposium honoring professor Alexander Chudnovsky during the ASME 2013 congress. To submit your abstract go to the ASME Congress 2013 web site http://www.asmeconferences.org/Congress2013/, then to the Track Mechanics of Solids, Structures and Fluids and open #10-24 Symposium on Fracture and Lifetime of Materials. If the website is asking you for a member ID number that means you have participated in an ASME event before. If you do not have this number handy please contact Customer Care at customercare@asme.org to obtain your member ID. Deadline extended to February 14. CME student Suriya Vallamsundar receives the Chancellor�s Graduate Fellowship Award. Are you interested in emerging technologies in environmental remediation? Are you looking for a place where you can discuss sustainable remediation practices with your peers, network with professionals in the environmental industry, and contribute your own ideas to the growing field of green and sustainable remediation? Consider joining UIC�s student chapter of SURF � the Sustainable Remediation Forum!